“Akagera national park, with all its complex mix of terrains, vegetation and animal life…. This savannah park is a very special place on earth, a place to preserve at all costs for future generations.” – Jean Pierre Vande, writing in the award-winning conservation magazine Africa Environment & Wildlife. Akagera comes as an exciting surprise after the steep cultivated hills and breezy climate that characterize the test of the country. Set at a relatively low altitude along the Tanzanian border, this beautiful game reserve protects an archetypal African savannah landscape of tangled acacia and brachystegia bush, interspersed with patches of open grassland and a dozen swamp-fringed lakes that follow the meandering course of the Akagera River. Akagera’s stirring and varied scenery is complemented by a superb range of big game. Herds of elephant and buffalo are most likely to be encountered when they emerge from the dense woodland to drink at the lakes, while lucky visitors might stumble across a lion, a leopard or a spotted hyena. Giraffe and zebra are frequently seen in open woodland, and more than a dozen types of antelope inhabit the park, most commonly the handsome chestnut-coated impala, but also the diminutive oribi and secretive bushbuck, as well as the ungainly tsessebe and the world’s largest antelope, the magnificent Cape eland. The recent introduction of lions and white rhinos transformed Akagera national park into a home for the big five game. 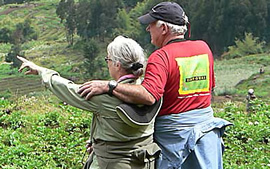 Wildlife safaris to Akagera are normally complemented with gorilla trekking in Volcanoes National park and chimpanzee trekking/Canopy walk in Nyungwe forest national park. To camp alongside Akagera’s picturesque lakes is a truly mystical introduction to the wonders of the African bush. Pods of 50 hippopotami grunt and splutter throughout the day, while outsized crocodiles soak in the sun with their vast jaws menacingly agape. Magically, the air is torn apart by the unforgettable high duetting of a pair of fish eagles, asserting their status as the uncontested king and queen of Africa’s waterways. Lining the lakes are some of the continent’s densest concentrations of water birds – storks, egrets, ibises, plovers, sandpipers, kingfishers and herons. The connecting marshes are the haunt of localised papyrus specialists such as the red, yellow and black papyrus gonolek, the secretive blue-headed coucal, and the singularly bizarre shoebill stork – the latter perhaps the most sought-after of all African birds.